The three schools all on the South Side: The Amandla Charter School in Englewood; Bronzeville Lighthouse Charter School in Bronzeville; and the Betty Shabazz, Sizemore Campus in West Englewood. The commission last night had several reasons for overriding CPS. Mostly, the interim director of the commission argues that CPS didn't follow the terms of the charter agreements and the fact that the vote was unanimous is telling. The commission also noted that the schools slated for closure had, in fact, shown improvement; although it recognizes that they do have further to go. Documents: See remediation plan scorecards for Amandla Charter School, Bronzeville Lighthouse Charter School and the Betty Shabazz, Sizemore Campus. Back in October the district announced new charter quality standards, put several schools on a warning list and slated four for immediate closure at the end of the school year. One of those schools opted not to appeal, but these other three did. For their part, Amandla, which is a grades five through 12 school, argued that it's just graduating its first class this spring, and hasn't had the chance yet to prove itself. “A lot of the work that we have been doing that hasn’t shown yet, especially around post-secondary preparation and access in enrollment for our seniors – I think we have some very strong results there and that will show as our first graduating class goes on and enrolls and persists in college,” said Jennifer Kirmes. The school says this year it has 35 seniors graduating, 80 to 85 percent of whom have gotten at least one acceptance into college. In addition, officials say they've done a great deal of coaching and development with teachers and adopted a new rigorous curriculum to improve student performance. The schools will complete this school year under CPS. Starting next school year, instead of receiving money from the district, those schools will receive funding directly from the state, which will be taking it from CPS' funding. The district says that should add up to an estimated $13 million if enrollment remains the same. Schools also have to meet state standards, instead of district standards, which are similar to CPS. Also, it'll be the state which will decide later on if these schools get renewed again. There's also the question of facilities – these schools are currently in CPS buildings. They'll also have to figure out how to pay for services they once received from the district at no additional cost, because they were CPS schools. The state commission's authority is one of the reasons the Chicago Teachers Union refused the last contract from the district. Union members felt it was a loophole that would allow the state to open more charters in the district, when the contract proposal would've capped the number of charters the district would allow. Forrest Claypool: "The decision last night was not about the best interests of our children." 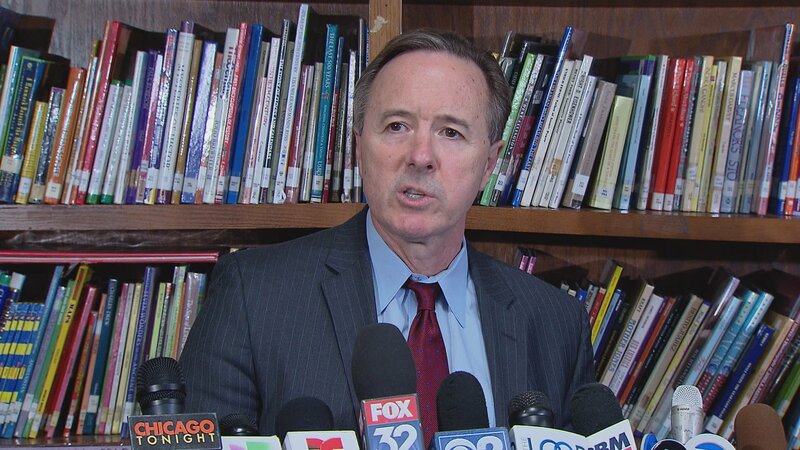 Today, we caught up with CPS CEO Forrest Claypool while he was visiting the district-run Perez Elementary in Pilsen. He called on the state General Assembly to reign in the authority of this charter commission. He also defended the district's decision and says it did follow the process. And, he had harsh words for the state commission and the governor. CPS says two of these schools were Level 2, up from a Level 3. And one of them is still rated a Level 3 school, the lowest of CPS' five quality ratings. The commission has only overruled local districts five other times, but those were for new charter applications, two of them for schools here in Chicago.